Blogoversary Giveaway #5 - Win a hamper from Pixy Natural! Here at Lovely Girlie Bits, we're huge fans of Irish brand Pixy and you can read our reviews of some of the products we were lucky enough to try. I have the ultimate rage as last night, I went to take a nice hot bath with one of their bath bombs and do you think I could find the plug for the bath?! Raaaage! So top of my list to buy this weekend is a bath plug so I can have me a nice hot soak with a bath bomb, followed by a quick foot scrub, ending it with some of the softening body oil. If that's not pampering myself, I don't know what is! The generous Pixy team have given us this gorgeous hamper to give away to one lucky winner and guess what? So followers near and far, do the widget thing and get entering! After reading CherrySue's recent post on her favourite blogging tools, I was inspired to jot down some of my tips that have worked for me over the past two years. These are not the be all and end all, just some things that have worked for moi and sharing is caring! I blog regularly. It doesn't matter if it's once a day, twice a day, or once a week. If you're consistent, your readers will know to look out for a post at a certain time. I schedule my posts to go up at 7.30am, when people are getting up, having breakfast and heading to work, and at noon, when people are starting to go on lunch at work. I use Twitterfeed. I tend to schedule my posts every night for the following day. Because I schedule them and like to tweet the link, I use Twitterfeed to post the link to my Twitter, Facebook and LinkedIn page. Where I work has the worse phone signal ever and I can't always access Twitter and Facebook, so this just takes a bit of pressure off. I don't spam my Twitter with my link millions of times a day. Twice usually does the job and I tend to unfollow people who repost the link at least three or four times a day. That's just my own pet peeve though. I try to be different. With the increasing number of beauty blogs out there now, it's important to try to be different, to put your own slant on things. If there's an event coming up or a product that a lot of bloggers have been sent, my little brain immediately starts thinking of how I can make my post different. I want my blog to stand out and if everyone is doing the same standard review of a foundation, I know people are going to read the first one or two that were written and that's it. I don't rush to be the first one to have a post up on a product, but then again, you won't see me reviewing something that has been out for months. Taking a long time to post on a product doesn't make my opinion any more valid and nobody will read it. I show off the products. This is just a personal thing for me and I know a lot of people aren't comfortable putting their faces on the interwebs. If I'm trying to figure out what foundation to try, a swatch on someone's arm won't help me see what coverage it gives. The same goes for lipstick. I like to see it on the lips and those kind of posts are my favourite to read on Temptalia. With eyeshadows, it's a bit different. I like seeing them on the arm but also in action on the eyes, so I like to try to do make up looks with them. I label my photos. Name your photos before uploading them. It's annoying, yes, but it means if someone searches for a product name and clicks the images tab, they'll see your photo. It's an easy way to get more traffic to your blog. And speaking of photos, make them as clear as possible. You really don't need a fancy camera. I used a weeny Canon point and click for the first year and learned to be best friends with the macro setting and have almost blinded myself in the eyeballs with the camera flash. I credit my inspiration. It's just good etiquette that if you've read a post or have seen a photo that has inspired you and end up blogging about it, just put a simple link to the blog post or photo. Imagine it was your post that you'd worked hard on or photo was used without your knowledge. It's just not on and just because you find it after Googling doesn't mean you shouldn't credit the photo!! This happened recently to a fellow blogger who saw a photo of theirs had been used in someone else's post and when they approached the blogger to ask to be credited for using their photo, they were told tough, it was found on Google so they don't have to credit it. Really bad form. I absolutely love blogging and all things beauty related. And I think it shows in my writing. To me, setting up this blog was never about getting free stuff and if I was never sent another thing, I'd still be blogging to beat the band. You will never see me asking who the PR is for such and such on Twitter. I just think that's tacky. I set this up as a hobby and a justification so I could continue to buy lots of beauty products I didn't need but wanted! None of my friends are that interested in beauty products and it was my little outlet to tell whoever wanted to read about which mascara is my favourite and other such lovely girlie things! I want the reader to feel like I'm sitting down with them and having the chats and I hope that comes through on this wee little blog. So I've shared my tips, what are your blogging tips? Blogoversary giveaway #4 - Win a Dermalogica Microzone facial and goodie bag with travel sized Dermalogica essentials from Nu Essence beauty! Today's giveaway is courtesy of our favourite salon, Nu Essence! Joanne had a stunning Shellac manicure done last year and after that, we bought Lovely Mammy Bits a voucher to get hers done there too! I had the MYscara treatment done and the HD brows too and loved the results of both treatments. Today we've a Goodie Bag with lots of Dermalogica travel sized essentials in it and to go along with that, we've a Dermalogica Microzone treatment! This is a prescriptive facial to suit all your skin needs, no matter what type of skin you have. I'll be trying this out myself very soon and can't wait! So to be in with a chance to win the facial and goodie bag, enter your deets in the widget below! The giveaway is open to residents of the Republic of Ireland and I want to hear all about it when you get the treatment! You can check out all of the treatments that Nu Essence offer here! Ok, seriously, September's over already? This was one of the busiest months ever both in real life and in the blogging world but it was a great one. We turned two and are having lots and lots of giveaways so click on the Giveaways tab at the top there to be in with a chance to win some fantastic prizes! So here are the products I've reached for again and again over the last month. As a beauty blogger, if I'm using something all the time, that means it's good squishy. Cicaplast Baume B5 (€12.50)- For me, with the colder weather comes seriously cracked lips and my Cicacplast Baume B5 from La Roche Posay has been such a saviour for me and dare I say that it's a Holy Grail product now. I'm so annoying, my lips get dry and I pick at the dry skin, lips get dry again and the cycle continues. Cicaplast repairs my lips fully overnight and I'm telling you, there's nothing else like it and I know my lip stuff. Also, I now have a stupid cold and can't breathe through my nose so lips are as dry as can be, but Cicaplast is helping them along with my little schnozz that I keep having to blow! Dior lippie and gloss (€16.99 each) - These were really unexpected purchases a couple of weeks ago in TK Maxx. I'm on a little shopping ban and have been so virtuous every time I go in to a chemist and keep smugly pointing out the fact that I didn't buy anything to Joanne. But come on, you see Dior at a discounted price, you buy it. No discussions. I've worn these two products almost every day for the past two weeks and if you want to see them up close and personal, just let me know. Loreal Mythic Oil (€19.00)- Want to know how much I love this stuff? I gave samples to the girls at work that should keep them going for ages even though I love it loads. I sacrificed some of this golden oil, this elixir if you will, to show others how amazing it is and they loved it. Hair oils and in particular this one are the reason why I've gone so long without getting my hair cut. A quick squirt or two into the palm of my hands and all is well with my hair, ends and all. You need this. Origins Clean Energy gentle cleansing oil (€24.00) - As the weather changes, so does my skincare and I learned that last winter. I've used this every day since buying it at the end of last month and can't say enough good things about it. It thoroughly cleanses my skin without drying it out and without going into it all again, I'll just say "Go try it". So that's it for this month! I've gotten a lot of gorgeous products in the post recently that I've been trying out and I know that some of them will make it to next month's favourites, so stay tuned and bye bye September! Blogoversary giveaway #3 - Win the You're A Star gift box from Lush! Two years ago when I first started the blog, I'd no idea it would grow into something this big and that's being completely honest! My first ever review was on Lush Marilyn Hair Treatment and it's still one of my all time favourite products that I repurchase again and again. I've been making my way through all that Lush has to offer and now you get to try some too! Look at this absolute beauty of a prize that's up for grabs thanks to Lush! Lush’s stellar glamour box that deserves its own place on Hollywood boulevard! As an homage to all the A list celebrities who buy our products, Lush has put together a gift set full of luxurious, skin caring top-to-toe bath and body treats for film star looks. Each product on the list has been bought by the celebrity attributed to it. It’s the perfect gift for those who want to share in the beauty secrets of the stars. Contains: Honey I Washed the Kids soap (Tyra Banks); Ma Bar bubble bar (Mischa Barton); Dream Cream body lotion (Halle Berry); Helping Hands (Angelina Jolie); Ceridwen’s Cauldron bath melt (Gwyneth Paltrow) and Floating Island bath melt (Eva Green). Seriously, is this not a gorgeous gift box?! You must know the dealio now, enter your details in the widget below. It's open to Ireland and the UK. PSST - Don't forget to click on the Giveaway tab up the top of the site there to make sure you haven't missed out on any fantastic prizes! We've got lots coming up! 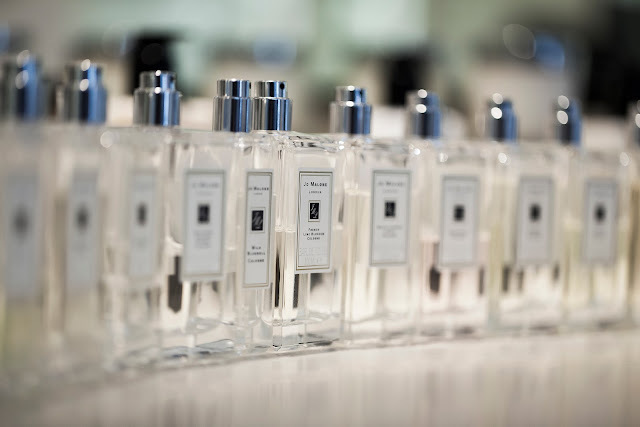 This month saw the launch of the new Idealia Skincare range from French skin care brand Vichy. It's rare that I sit at a presentation and feel that the product was made for me. Seriously, I sat there and listened to the presentation, nodding along, saying to myself "Yep, that's me, yep, yep"... As the presentation went on, I started to look around for the hidden cameras. This had to be a joke. Was PJ Gallagher going to turn up dressed as the aul bridie from Meath Street, slagging me that I'd never have ideal skin? A recent study explained how every woman wants ideal skin and how 80% of women aged 30-50 are concerned with dark spots and uneven skin tone (yes, yes I am) along with brown spots, sun spots, ageing spots, blemish marks and blotchiness. Yes for all of those as far as I'm concerned. The Vichy Idealia Smoothing and Illuminating Cream (€26.00/50ml) has active ingredients and the star of the show is Kombucha, an ancient natural ingredient made from Ceylon tea that helps tone the skin. The other active ingredients are AHAs to smooth skin texture, Vitamin B to increase radiance and polyphenols to aid micro-circulation. First of all, the Smoothing and Illuminating Cream is pink. I like that. I don't know why. I just do. Second of all, it feels gorgeous on my skin. It has a light texture that absorbs easily into the skin and feels cool on my face. For that reason I love using it in the morning. When I first apply it, I can really get the scent of the Kombucha tea and find it almost calming. It dissipates pretty quickly leaving me with hydrated, smooth skin, ready for foundation. My skin does look more even since using it and looks brighter and more refined. The Idealia Pro Deep dark spot corrector (€34.50/30 mls) is targeted towards those who have dark spots and uneven skin tone. It works by working on the dermis and epidermis level, targeting the source of those dark pigmentation spots. The LHAs help reduce dark spots and the DRM-Bright Complex help prevent them. I don't have a huge problem with pigmentation spots at the moment as I was meticulous with my skin care this year, but I can tell you that this creamy serum feels gorgeous on my skin. I know after the summer my skin had a few pigmentation spots from the sun but right now it's ok. I've tried out Idealia Pro under the llluminating and Smoothing cream and they work together perfectly. Lovely Girlie Mammy Bits has some pigmentation marks on her face so she's been told she'll be testing this out for me. The Idealia Skincare range is out in chemists now and ladies, I'm going to use the C word now. These two products would make a fantastic Christmas present for your mammy! She will love you forever and you can hold it over her head that the reason her face looks gorgeous is because of you! Who doesn't want Ideal skin? Today's the second day of our blogoversary celebrations and we've quite a way to go yet! Take a look at the prize we have in store for one lucky winner is from Irish Online Beauty Store BeautyEmporium.ie. Steph has generously given us some fantastic products from Daniel Sandler! Worth over €70, we've a Daniel Sandler Invisible Blotting Powder that keeps shine at bay without altering the shade of your foundation. 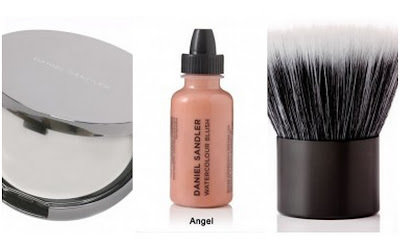 To go along with that, we've a Daniel Sandler Kabeauti brush that can be used on your face and body and a Daniel Sandler Watercolour Blush in the shade Angel. This silicon based oil free formulation gives an instant radiance and stays put. I must admit, I'm quite jealous of this prize! Want to be in with a chance to win? Just do your jiggery pokery in the widget below! A few months ago on a trip to Belfast, I picked up these gorgeous liners from Sleek, but held off on blogging about them until they became available in Ireland. And now us Irish ladies can get them from Cloud10Beauty.com! I'm all about adding colour with liners and the shades I bought just happen to be perfect as we hurtle into autumn. First up is Tonic. 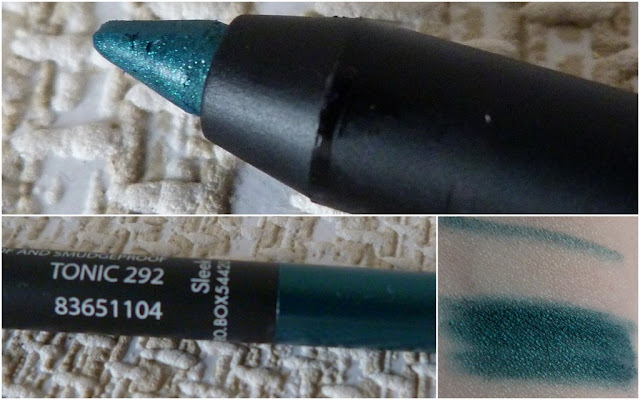 This metallic emerald green liner is gorgeous along the waterline and under the lower lashes for a bit of colour. 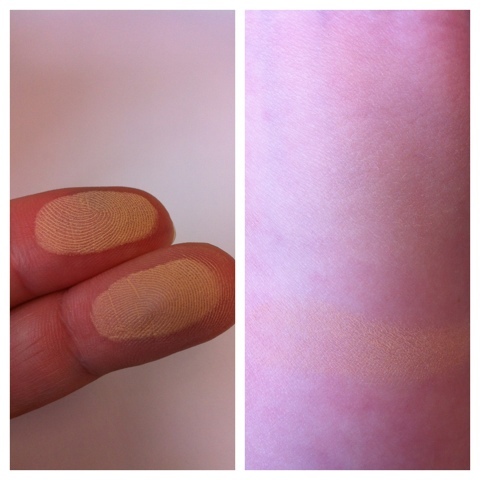 I found it was a bit hard when I did one swipe but once it warmed up a bit in the bigger swatch below, it was creamy and pigmented. The glitter doesn't show up when applied on the skin but I still love the colour anyway. 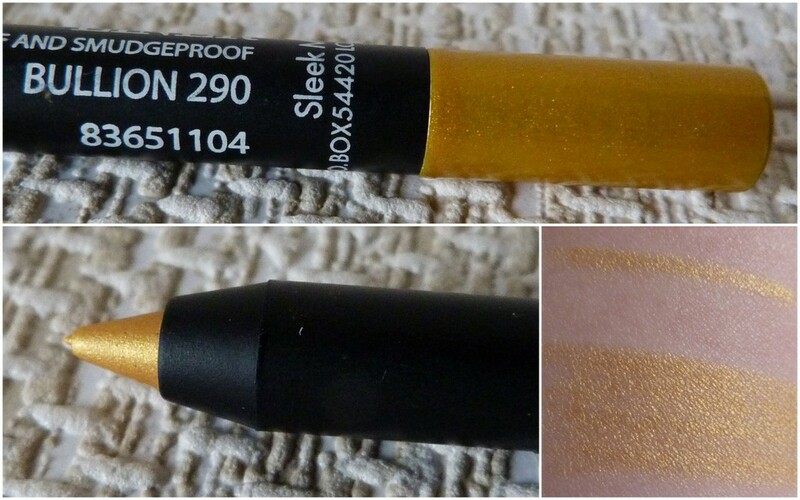 Bullion is a shimmery gold liner that totally lives up to it's name. I've been wearing this on the inner corner of my eyes to help me look more awake and also as a base for eyeshadows. You can either apply it directly to your eyelids or what I like to do is apply it to my finger and then pat my finger onto my lid. It's just a bit more gentle that way and there's no pulling or tugging on that delicate skin. Last of the trio is Blue Moon. I bought it prior to getting Azure Blue from YSL's summer collection and sadly it's not a dupe but is still pretty gorgeous. It's more of a blue green than a true blue (baby I love you). If you don't get that reference, leave this blog now and go hang your head in shame! 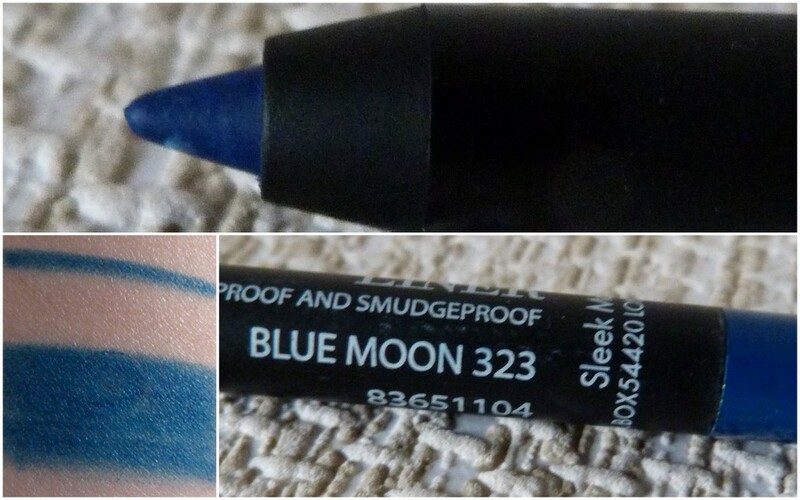 Blue Moon is the most creamy of the three I have and you can see that from the single swipe. No pulling or dragging at all. These bad boys stay put for the whole day. I haven't tested to see if they're waterproof yet but they are completely smudgeproof. I have my eye on more of these liners, namely Pumpkin, Raisin and Satchel. You can find them here on Cloud10Beauty.com. Have you tried these yet? Flash giveaway! Win tickets to the Harvey Nichols A/W 2012 fashion show! Hands up who'd like to come to the Harvey Nichols Autumn Winter 2012 fashion show this Wednesday, September 26th at 5.30pm in Dundrum Town Centre? All you have to do to be in with a chance of winning two tickets to see the fashion show that will feature looks from brands including Alice & Olivia, Amanda Wakeley, Vivienne Westwood and Elie Tahari to name but a few, is leave a comment and your email address in the comments below! I can't wait to see what Harvey Nichols has in store for us this season! The winner will be chosen at random Tuesday, September 25th at 6pm, so you've 24 hours to go! Blogoversary giveaway! Win one of two gift cards from Penneys worth €50 each! Here at Lovely Girlie Bits, we're huge shoppers, especially when it comes to Penneys! Where else can you get bargains galore, dress yourself from head to toe for next to nothing but still be on trend? I've a cute story to tell you. One of the girls at work was telling us a story last week about her friend's little girl who'd just gotten her hair cut. Everyone was telling her how gorgeous her hair was. Her response was "Thanks, Penneys!" It was obviously built in that when someone compliments you, the usual response is "Thanks, Penneys!" We've teamed up with Penneys to celebrate our two year Blogoversary and the launch of Penneys Limited Edition collection this month. 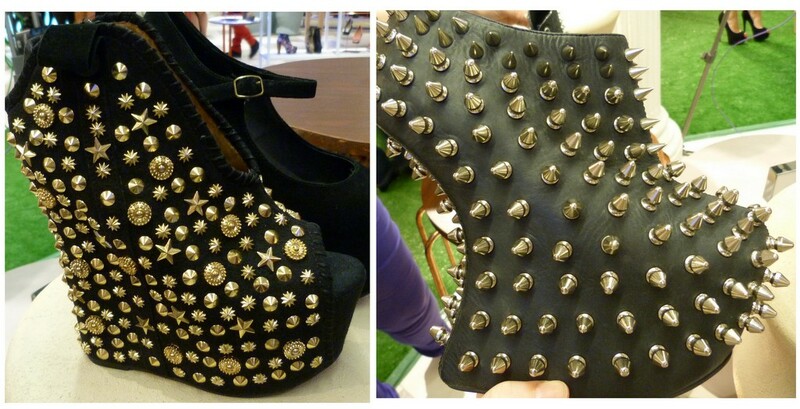 It's a collection that's full of texture and print, with vibrant tones and studded accessories and spiked jewellery. We can't wait to go in to the newly renovated Mary Street shop for a look! 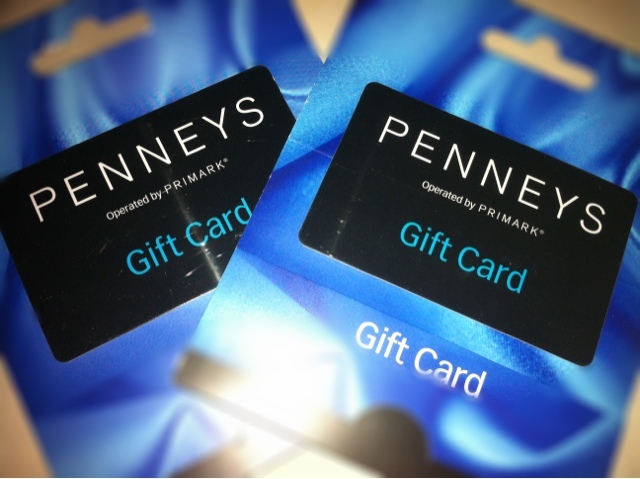 We've two gift cards from Penneys worth €50 each to give away! Enter your details in the widget below to be in with a chance to win one of these cards and you can shop to your heart's content! Thank you so much to Penneys for being so generous in supporting our two year blogoversary! This week marks the two year anniversary of the blog and I don't know where the last year has gone! It feels like we were only celebrating the end of year one recently, but another twelve months has been racked up and with over 650 posts. I thought I'd be completely self absorbed and share with you my favourite five posts from the last two years! 1. You know you're a beauty junkie when.... Part 1 - This post seemed to resonate a lot with fellow beauty junkies across the globe and I felt comforted that I wasn't alone in how weird I am when it comes to beauty products! 2. This was followed swiftly by You know you're a beauty junkie when Part 2! - The lunacy continued in the follow up post. 3. We all know I'm rubbish at nail art but I loved playing with my striping tape and creating this gorgeous manicure! 4. Battle of the waterproof mascaras. - I used my scientific experience to test these mascaras out in a foolproof way! 5. A letter to 19 year old me. - This was a bit of a different post and one that took a long time to write. I'm glad I did it and the feedback from everyone has been fantastic. To thank you all for your support over the past two years, I've some fantastic giveaways coming up over the next couple of weeks. I have some big plans for the blog over the next year, so let's see what happens! Thank you for reading, commenting on, retweeting and Facebook liking the posts. I'll do my best to keep it fresh and interesting and of course keep my personality and sense of humour coming through! Stay tuned for the first giveaway later today! As someone who has an oily T-zone that could blind you on a sunny day, it's important for me to protect your eyeballs from my facial shine. Seriously, it can be really bad sometimes. You know when you're driving home on an autumn evening and the sun is low and shining right in your eyes, so you have to sit up poker straight in your seat to hide your peepers behind the visor? That. That is what my oily face can do. This Natural Finish Pressed Powder (€23.00) arrived from Liz Earle and I got stuck in to it with the aim of protecting everyone's retinas. The midnight blue packaging is sleek and shiny. When you open it, there's a mirror, the powder and under the powder, there's a section for the sponge should you like to use that. I'm always fearful that I'll use too much powder if I apply it with a sponge, so I've been using my big EcoTools powder blush and it's a match made in heaven. I do like to play with the sponge from time to time and pretend I'm a lady powdering my nose. I blame the return of Downton Abbey for my ladylike behaviour. The powder itself is light and silky in texture and enriched with a blend of natural source vitamin C, borage and avocado. There are seven shades in the range and I've been using the second lightest, Sheer Ivory, mainly on my forehead, nose and chin. I usually apply it at 7am and the matte, velvety finish that it gives my skin lasts until about noon and even at then, it's only my nose that has started to look shiny. My forehead stays smooth and matte and stays like that for the rest of the work day. It feels light on my skin and most important of all, it doesn't look cakey. This is now the powder I reach for on a daily basis, it's gorgeous. You can buy it on the Liz Earle website along with the rest of the gorgeous make up range. Over the past six months or so, I've had the chance to try out some serums and without even trying, they've all slotted into my skin care routine effortlessly. I really do think my skin has never looked or felt better and I'm a firm believe that serums have played a huge part in it. Any time I've stopped using a serum for whatever reason, as soon as I start using one again, my skin perks up and that's enough for me to keep using them. No matter what your budget, there's something for everyone out there on the market and I'd love people to try just one and see how their skin was afterwards. Serums are super concentrated and are packed with active ingredients, which is why you only need a weeny blob to do your face before applying your moisturiser. I've been using different ones every morning and night and my skin loves them. Origins Plantscription Anti-aging serum (€63/30mls)- One of the newest members of the serum sisters, this velvety feeling serum promises to help reduce the appearance of wrinkles while giving the skin a youthful glow and that bouncey feeling we're all after without looking like we're Madonna with a face full of fillers. It glides on like silk and as I've just started using it over the past couple of weeks, I can't give you my proper review yet, but I've been loving using it at night before bed. La Roche Posay Hydraphase Intense Serum (€23.00/30mls). I've been dying to try this out and when it came through the letterbox last week, it was a close call as Bailey tried to eat the packaging. It's aimed at dry skin so I'm currently making Joanne test this out. It contains fragmented Hyaluronic acid and gives both immediate and long lasting hydration and of course has La Roche Posay Thermal Spring Water which soothes and hydrates the skin. Stay tuned for a full review that I'm bullying Joanne into doing. Yves Saint Laurent Forever Youth Liberator Serum (€77.00/30mls). Targeted towards ageing skin, this serum uses glycobiology and to make a long story short, it contains glycans which help increase communication between your cells. As we age, the glycans die off and we need them to help our skin stay young looking. This serum helps plump my skin and feels nice and light on my face. Image MD Reconstructive Serum (€64.50/30mls)- This delicately scented creamy serum has Tri-C Complex and promises to lighten, tighten and brighten the skin. It's one of the serums that feels like a moisturiser in terms of how my skin feels right after application and is aimed at ageing skin, dry/dehydrated skin, rosacea prone and sensitive skin. My mam has her eye on this one so we'll see if I'm feeling generous but I've loved using it so far. Dr Andrew Weil for Origins Mega-Bright Serum (€62.00/30 mls) - I've reviewed this in full here but I'm still a big fan of it and I'm at the last dregs of it. It helps target pigmentation spots on your skin and I found it helped bring a radiance to my skin. Vichy LiftActiv Serum 10 (€34.00/30mls) - Full of rhamnose for anti-ageing, hyaluronic acid to help hydrate and plump the skin and mineral rich Vichy Thermal Spa Water, this was the first serum I'd tried in ages and have no idea why I didn't review it. The ceremides in it helps your skin to absorb the active ingredients. It feels light on my skin and helps it feel smoother and firmer. TheLoop.ie - buy before you fly! My dad would have gotten a great kick out of yesterday. See, he loved going to the airport and was a firm believer that your holiday started as soon as you set foot inside the terminal. We were never ever late to the airport as he would have the taxi ordered days in advance to get us there a full three hours before our flight. This meant I've had lots and lots of time to browse the duty free over the years! Last night I went to the launch of TheLoop.ie, the online store for The Loop at Dublin, Cork and Shannon Airports. Hold on a second, I hear you say, why would you need to shop before even leaving your home? Well, lots of reasons! Imagine you're going on an early morning flight. 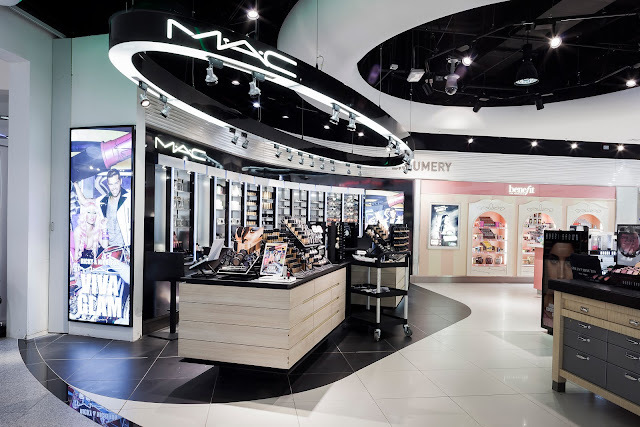 Are you going to want to browse the duty free at that hour? (Me, I totally would but I'm a professional shopper, so that doesn't really apply to everyone...) There are so many baggage restrictions these days and by buying before you leave your house, you can either pick up your purchases on your way to your destination or using the Shop and Collect feature, you can collect it on your way home from your holidays! When you've bought your chosen items, you'll need to enter in your flight details. You can start your shopping 28 days before you leave and have up until 48 hours prior to your departure time to make those all important purchases. We're heading to New York in November and I have my eye on a bottle of Chanel Coco Noir that might just have to be my scent of that holiday! Check out TheLoop.ie for a full list of products and start planning your holiday now! Since my dad believed your holiday started the moment you set foot inside the airport, does it now mean it starts when you make your first purchase on TheLoop.ie? I love a bargain and budgetastic brand NYC have five new eyeshadow quads, or Quatros as they call them. And they're €3.49. I know. You could get all five for under €20?! 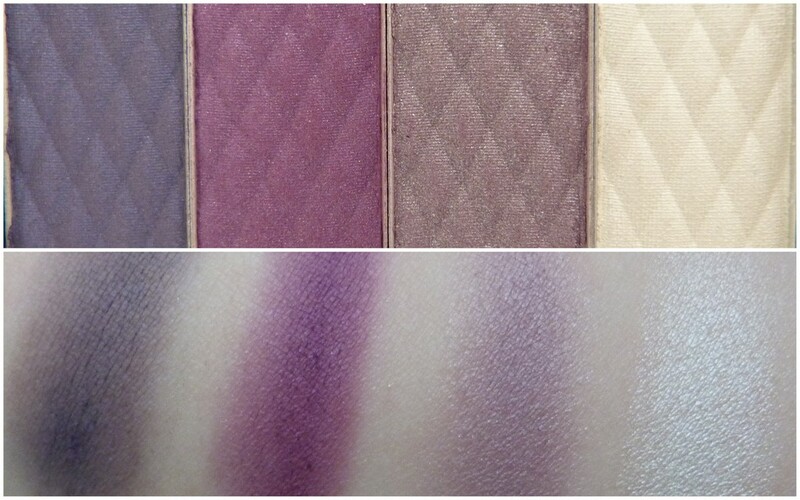 Ranging from neutrals, to greens, purples to smokey, there's not one I can't wait to get stuck in to. Each palette has a light shimmery base, two darker shades and a smokey shadow to add depth and definition to your make up look. The shadows are creamy, pigmented and blendable. There's some fall out but nothing that a bit of tapping of your brush will help eliminate. Best of Broadway is a neutral palette that was my immediate favourite on first look. I do have a bit of a soft spot for neutrals and I like neutral looks most days going to work and this palette has made it's way into the drawer at work, ready for make up emergencies and yes, I have had lots of those! Fashion Bootcamp has some lovely greens and will camouflage your eyes should you be in a jungle somewhere. Or just want to create a green smokey eye. Your choice. 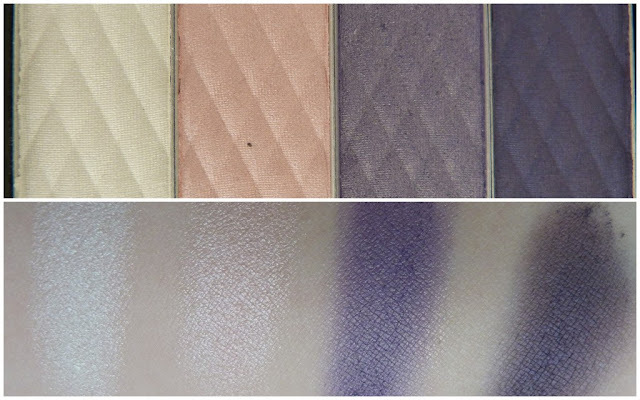 I love me some purple shadows and NY Tribute has a medium shimmery purple shadow together with a darker matte shade that will be making my green eyes even greener. The pale pink shadow makes a nice base over the lids and I can't wait to play with this one. If you like the purples too, this next one has three different shades, one being a vibrant pinky/purpley shadow. That's my favourite shade out of Queens Boulevard and I'll be sporting a look with this very soon indeed. We all know I love a bit of drama on the eyes. None of this less is more stuff, no, more is more! And as the evenings get darker, I love to pack the colour on. Each of the shades in the Gothic Harlem quatro are pigmented and blendable, so stay tuned for a really affordable and easy smokey eye very soon. The HD Color Quatro Eyeshadow Palettes are most definitely worth a shot and for the price, you can pick up more than one and have no guilt! Shoes. I have way too many pairs. But does that stop me from buying more? Not at all. And now it's going to get harder to stop myself from adding to my collection. Arnotts have a new 10,000 square foot Shoe Garden on their ground floor and it's my little piece of heaven. Well lit and beautiful displays make perusing a joy. 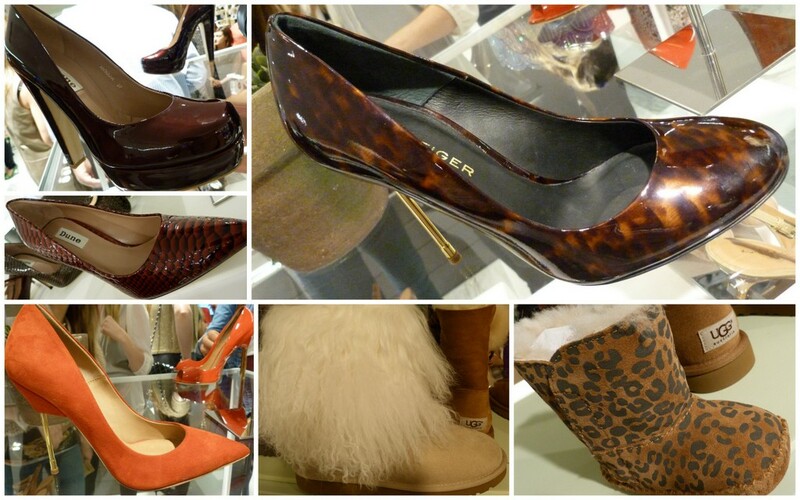 We went into town on Saturday for a little preview and oohed and ahhed over the 50,000 pairs of shoes by 47 brands and I could have stayed there all day! Last night we popped along to the official launch of Arnotts Shoe Garden where the stunning Alicia Dixon was there to host a fun filled, shoe filled night! Of course she had her best heels on which would be sitting down shoes for me. Joanne was having a mosey in the Shoe Garden earlier yesterday and stumbled across Alicia doing her thing! What better way to show off the shoes than with a little fashion show, and when I say little, I mean these models danced and boogied their little selves away up and down the grassy runway. 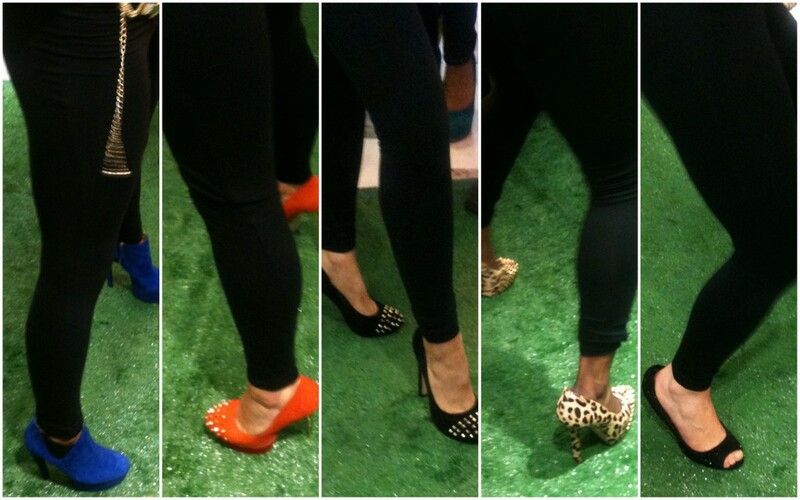 I was exhausted just looking at them as they shimmied and strutted to shoe themed songs! When they stopped long enough to snap a photo, Joanne was quick on the draw. How did they dance in these?! I couldn't even sit down in these shoes without falling. I love the cobalt blue boots and the leopard print ones, cute! They have some massive scary shoes that weigh a tonne so if you're looking for a good leg workout and want to be on trend with some studs, these guys are the ones for you. I did some bicep curls with them. We took snaps of some of our favourites and I had to include that furry Ugg boot below. If Bailey was a boot, that's what he'd look like. And look at the lil baby leopard print Ugg boot!! I want all of the Buffalo shoes, especially those ankle boots. Lovely. And finally, what garden would be complete without a trellis? You can find Lipsy hanging out on the garden trellis, ready to be investigated. If you haven't visited it already, go have a wander around the Arnotts Shoe Garden. It's a magical place with shoes as far as the eye can see! Now that it's autumn, I'm saying goodbye to all my bright summer polishes and am looking forward to getting into the darker shades. These bargaintastic polishes arrived at Casa Girlie Bits last week from New York Colour and I knew that summer was going to be a distant memory. But I didn't care, I had lovely polishes! 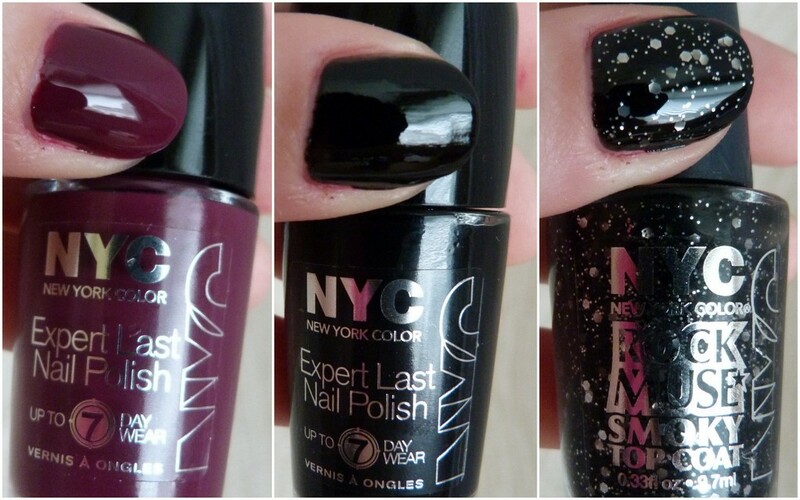 Here are the NYC Expert Last Nail Polishes and they retail at €1.99. So practically nothing... No excuse.. The Demon Glow Top Coat is a UV top coat and due to my old age and not going anywhere that has UV light, I haven't tested it out but I shall donate it to the younger girls at work and see what they think. I was in Madonna's in Temple Bar earlier this year and that had a UV light section which makes you just look awful! Blonde hair goes green, freckles or blemishes go brown, not a pretty sight! Left: In A NY Minute - Chelsea, right: Rock Muse Smoky Top Coat. I thought I'd show you the red polishes first. I do love a bit of red on the nails and these polishes are a joy to work with. They've a wide brush and in the photos below, I've only two coats of each shade on. Fine Red Wine and Chelsea Cherry are jelly polishes where as Chelsea in the middle there is a shimmery deep red. Delish. Take a closer look. And on to the darker ones. I am in The Love with Boundless Berry, anything purple at this time of year just makes me happy. City Blackout is a plain black polish and I've topped it with Rock Muse Smoky Top Coat and this is gorgeous! It reminds me of a clear night sky. The top coat applies really easily and the glitter bits stay put easily enough. An effortless manicure that will have everyone intrigued. Affordable polishes like these ones from New York Colour make it so easy to play with different trends and not spend a fortune. It's brands like this that are the reason I've a nail polish stash so big I could open my own shop! You can find NYC products in chemists, Penneys and Dunnes nationwide. And guess what? In 9 weeks, Joanne and I are jetting off to New York City ourselves and bringing Lovely Mammy Bits! We can't wait, Thanksgiving, the sales, wandering and finding new places, the Rockettes.... Bring it on! As much as I love packing on the colour when it comes to my eyeshadow, I tend to reserve that for my weekend shenanigans! During the work week, I'm a neutral shadow lover and Stila's In the Light palette is a must have for the Neutral Nancys among us. 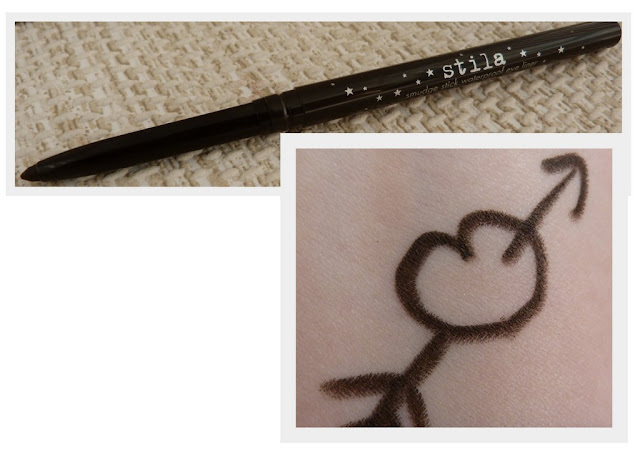 I was given this when I met up with the Stila team last week and may or may not have given it a little hug and a squeeze when I saw it. In The Light has ten shades, four matte and six shimmery. All are buttery, soft, wearable and suitable for most skin tones. It also comes with a full size smudge stick waterproof eye liner in Damsel, a matte chocolate brown. Nice. 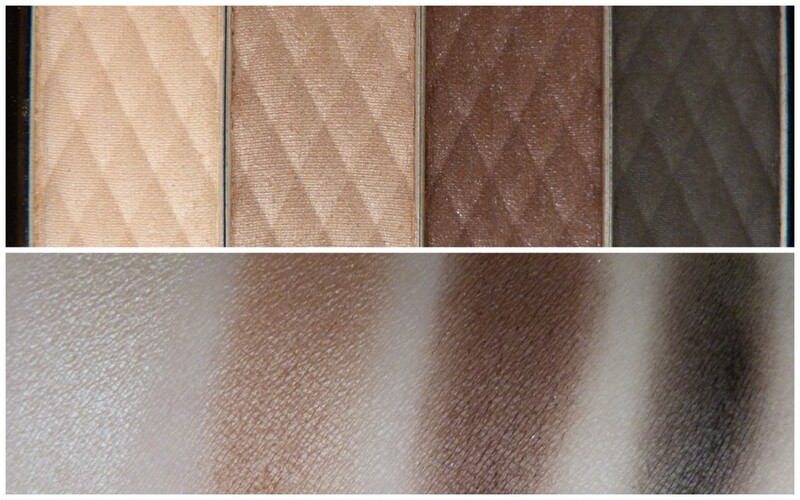 The top row has the lighter shades and contains one of my all time favourite shadows, Kitten. I'm kind of in the love with Bliss too, that's the middle one. I go through phases of using mattes, then switch it up with the shimmers and this palette allows me to do that. 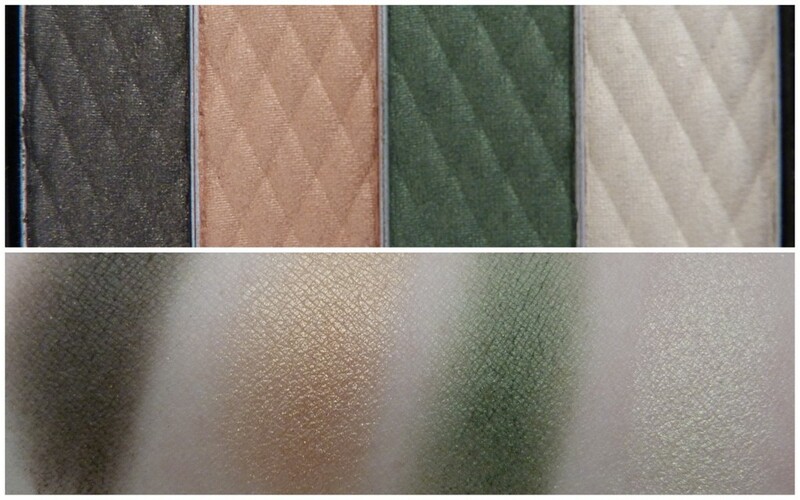 The mattes are pigmented and not dry, the way some mattes can be, but these are really blendable and will change your mind if you're a bit scared of them. The bottom row contains the darker shades and I can't wait to get stuck into them! 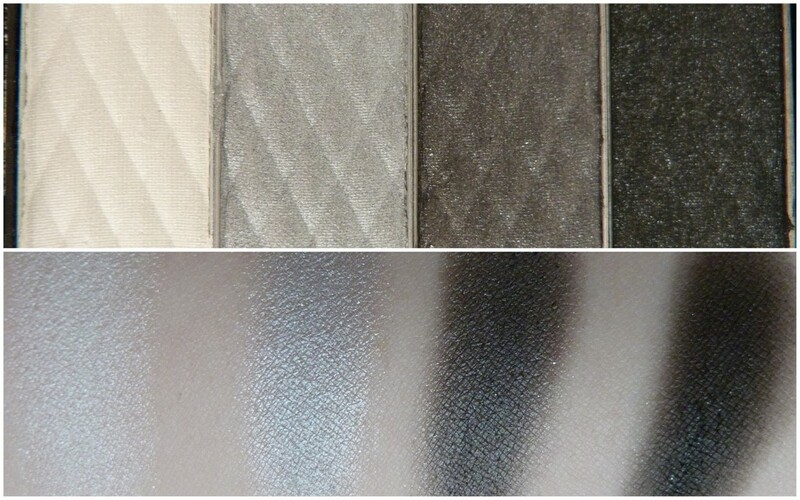 Luster and Night Sky have my name all over them and I already want to do some smokey eyes with them. You can use all of the shadows wet or dry. I've been meaning to try out the smudge sticks for ages now and Damsel is the perfect accompaniment to In The Light. It's a dark matte chocolate shade and can be used either as an eyeliner, or as a base for the shadows. I'll have some eye make up looks with this palette coming up so stay tuned. Lads, this is a must have. It's on the Stila website at £25 which is about €34. I have the Naked palette from Urban Decay (what beauty blogger doesn't at this stage) and I use maybe half of the shadows. With this one, I know I'll be using every single one. The only gripe I have is that it doesn't have a mirror in the lid, but that's it. Otherwise, it's perfect for me. Get yourself down to the Stila counter at Harvey Nichols Dundrum to either a) get one for yourself or b) point it out to someone to buy for you in the near future! Guest post - Autumn Trend - Orange!